A sleeveless muscle shirt is a must have workout clothes item. Find the top names including World, Powerhouse, and Gold Gym lines. A sleeveless muscle t shirt is similar in coverage to a full-cut athletic tank top. A sleeveless muscle shirts are shipped the same business day. 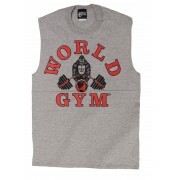 sleeveless muscle shirt with the World Gym gorilla logo. Most colors are 100% cotton except the gray sleeveless muscle t shirt. 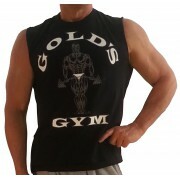 Same business day shipping on World Gym Shirts and workout clothing to destinations around the globe. XXL-Add $ 2 ..